The Federal Trade Commission is mailing 1,251 checks totaling more than $647,000 to non-profit organizations, churches, schools, small businesses, and volunteers that were tricked into buying office supply products at higher prices or in larger quantities than they had agreed upon. 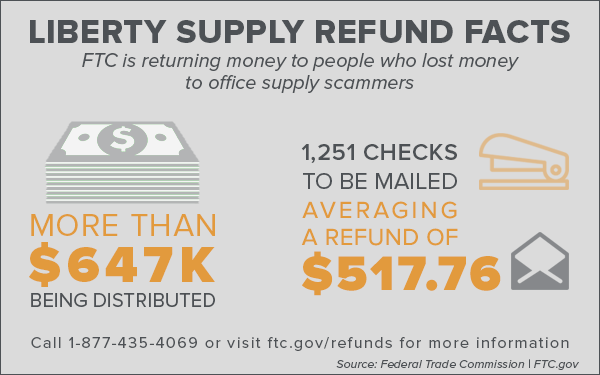 In December 2015, the FTC charged the operators of Liberty Supply Company, an office supply scheme, with bilking millions of dollars from consumers by misrepresenting prices and quantities, and then demanding payment or forcing consumers to pay hefty shipping and restocking fees to return the unwanted or overpriced products. The average refund amount is $517.76. Recipients should deposit or cash checks by January 27, 2019, as indicated on the check. The FTC never requires people to pay money or provide account information to cash a refund check. To learn more about the case, contact the FTC’s refund administrator at 1-877-435-4069. Liberty Supply Co., et al.